Tesla Model S battery fire: Elon Musk defends safety record, criticizes firefighters. Inferior gas-powered cars look on in admiration at how well the Tesla is handling this fire. You’ve gotta love Elon Musk. Well, you don’t have to, but you might as well. It’s more fun than hating him, and in any case he’s not going away anytime soon. 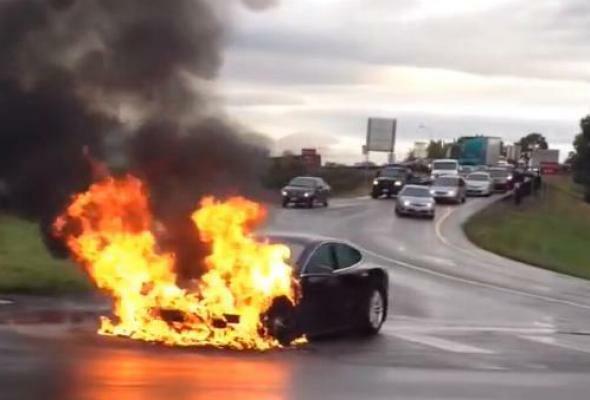 To recap: A guy was driving his Tesla Model S in suburban Seattle the other day, heard a clunk, pulled over, and the next thing you know his gorgeous electric luxury car was shooting flames from its battery. Firefighters struggled to douse the blaze, but eventually they put it out. Meanwhile, a passerby put a video on YouTube, Tesla’s stock took a hit, and suddenly people are asking once again whether electric cars are really safe. And now, on cue, everyone’s favorite real-life Tony Stark has arrived on the scene to explain how this is all further proof of the Tesla’s unrivaled greatness. In a blog post published Friday afternoon, Musk informs us that the likely culprit was a curved piece of metal that fell off of a semi trailer. Based on the size of the hole in the underside of the Model S, coupled with the geometry of the object and the angle of incidence, Musk is able to discern that the debris must have hit the car with a peak force “on the order of 25 tons.” That being the case, he goes on, the driver ought to be mighty thankful that he was in a Tesla Model S and not some inferior variety of vehicle. “Had a conventional gasoline car encountered the same object on the highway, the result could have been far worse,” he warns. To be clear, I’m not saying he’s wrong. I’m just saying that, when it comes to dealing with bad press, he could teach chutzpah lessons to Billy Flynn.